Think those Shawn Wasabi finger drumming videos are cool, but have no idea what’s going on? Just picked up a Midi Fighter 3D and want to get started right away playing beats? This article is for you. Inside, get a better understanding of what’s actually happening in the videos, and some tips for getting started. This article is intended to give new and aspiring performers a good sense of how to get started (we get hundreds of questions about this every month). Have knowledge or advice to share? Please do so in the comments! What am I looking at in Shawn’s videos? Finger Drumming! 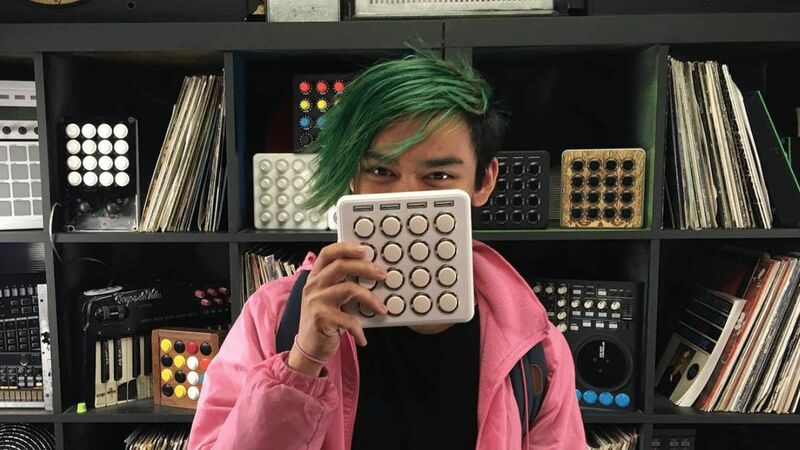 Shawn Wasabi relies on a Midi Fighter to make his amazing videos. The Midi Fighter is one of the most popular finger drumming controllers on the market. The authentic Japanese arcade buttons are among the highest quality buttons in the world. They offer a hyper-low latency and the highest durability around (yes, the same ones used on arcade machines). What’s actually coming through your speakers is the Midi Fighter triggering audio samples that are in the computer software Ableton Live. To do this, Shawn compiles 16 (or more!) samples he likes and activates them in Live using the Midi Fighter. This “playable song” is called a soundpack. Shawn’s videos also have fun LED light shows. Eye-catching LED light animations illuminate the controller by default, but Shawn takes it even further with custom light shows. These advanced light shows do take some extra setup time and work great for routines. However, we recommend nailing the drumming part first before you start adding extras. Before computers, people played traditional instruments but today with electronic music – there is not a standard EDM instruments. When you combine real musicianship (drumming) with electronic sounds (sound packs), you get finger drumming. It’s insanely fun and introduces dynamics back into modern dance music. Imagine the Midi Fighter is a laptop keyboard. On a laptop, each time you hit the letter “A”, you’ll see the letter “A” popup on the screen. The Midi Fighter’s buttons work the same way except you get to choose what sound corresponds to each button. A single button could trigger a drum loop, vocal line, melodic sounds or single percussive hit. A great way to get started finger drumming is to start playing drums over your favorite song. If you can type, you can finger drum. Just like any musical instrument It just takes some practice and the more time you spend on it the better you’ll get. Part of what makes Shawn’s videos so unique is his careful sound selection. You can use any sound imaginable to create your own sound packs or remixes. adjust the start and end points so only the part you select from that file will be heard when triggered (e.g. : only using the “I have a dream” part of Martin Luther King Jr’s famous speech). Where Do I Find Sounds Like Shawn? We recommend getting started using pre-created sound packs like Mad Zach Volume 5. This gives you immediate access to 15 great-sounding songs. They’re like Shawn Wasabi’s and ready to jam on immediately. These sound packs are editable, should you want to swap out a kick sample or synthesizer sound. Volume 5 has extra lesson videos included in the Ableton Live session files that teach you how to play with a Midi Fighter. The video speed can be adjusted so you learn at whatever speed you are comfortable with. How Hard Is This / Who Can Learn To Fingerdrum? Think of learning to finger drum as modern piano lessons. It’s not too different than a traditional instrument – age isn’t a big factor. It does take some practice and a little help at the beginning – so we’ve provided free resources to help you get started below. 1. Get your first hardware or software setup. Software: Download and install the trial version of Ableton Live Suite. It works on both Mac and PC and you can keep using the trial as long as you want, even after the 30 day trial ends. The only limitation is that after 30 days, saving and exporting will be de-activated. Hardware: We recommend buying the Midi Fighter 3D for the most fun getting started with finger drumming. If you care to test out the sounds and software before spending $200, you can use your computer keyboard to finger drum within Ableton. To activate this feature in Ableton, just hit the small button in the top right corner of the screen that looks like a piano (and skip to the next step). Here is a free download to one of our favorite soundpacks for finger drumming. First, make sure Ableton is installed. Here’s a video walking you through the installation of a soundpack similar to the video below. The installation has worked if you see a file named “Jakarta.als”. Just double click that file to open it up. Play around and see what happens. Start with one thing at a time: A great way to get started finger drumming is to start playing drums beats over your favorite song. This will help you practice your timing and commit some drum beats to muscle memory. Start with just 10 minutes a day. The easiest way to begin is to add only snares and hi-hat sounds over your favorite song. Learn some essential techniques and drum beats: below is video tutorial showing you some basic techniques and beats you can practice. Have fun: getting started is always the hardest part, so if you find yourself getting frustrated, just take a step back and ask yourself how you can make what you are doing more fun. Sometimes this means going back the basics and finger drumming over a favorite song. Play Games: Melodics – after you’ve gotten a Midi Fighter, this is a great way to learn finger drumming in a video game format. Once you’ve got a few drum rhythms committed to muscle memory, or are just starting to feel comfortable with Ableton, you can start creating your own soundpacks or edit your favorite packs. Here’s how to load sounds into a Drum Rack (in Ableton), which the Midi Fighter can then trigger. If you really want to challenge yourself then commit to posting one video per week on social media or YouTube. This will force you to practice regularly and gives you the ability to watch your recorded routines and note what needs improvement. For 1 on 1 help, talk with our real producer-DJs on Live Chat in our online store. How can we make this more helpful? Post your questions in the comments below – we want to make this the most helpful intro guide possible! Wondering what the deal is with this new Midi Fighter 64 Shawn uses on most of his videos? We know many of you have been waiting patiently to see if we were going to make Midi Fighter 64 available to everyone – not just a custom one off controller for a single artist. Details on pricing, timeline, and all that other information is still being finalized, but if you’re on that list you will be the first to know, first able to preorder, etc. Stay tuned!